Control of the U.S. House of Representatives may not be at stake in 2014, if our recent analysis is correct, but control of the House in 2022 could be. It’s simple electoral math. Many of the governors being elected or reelected in 2014 may still be in office after the next census is released in 2021. And they’ll have a fair amount of influence, often via their veto power or party leadership, on the House redistricting that takes place prior to the 2022 elections. As we discovered anew in 2010 and 2011, the decennial redistricting can greatly influence control of the House for the better part of a decade (maybe the whole decade). So it really matters for the House who wins the statehouses. Keep in mind that, of the last five elected governors in all 50 states, close to half — 114 — have served at least two full terms, and of those, 32 have served even longer (numbers that will eventually include some current incumbents). First-term governors elected in 2014 have a good chance to still be in office in 2021; some elected in 2010 could possibly still be around due to a lack of term limits. Two examples are Govs. Andrew Cuomo (D-NY) and Scott Walker (R-WI), should their potential presidential runs not pan out. Thus, the distance between 2014 and 2022 is shorter than you may think. There are quite a few fascinating gubernatorial contests developing around the nation. Some are truly competitive, such as Florida’s looming heavyweight bout between first-term Gov. Rick Scott (R) and former Gov. Charlie Crist (R-turned-I-turned-D). Scott looked like road kill earlier, but he’s been bouncing back a bit, and will have nearly unlimited financial resources. In Pennsylvania, Gov. Tom Corbett (R) is in a world of trouble — just one in five voters believe he deserves a second term, and incredibly, just 38% of voters from his own party do so. That race continues to be a strong bet to see a party switch if Democrats can settle on a nominee from a large field without ripping each other apart. Sometimes, a race for governor becomes a national fixation even when the state is noncompetitive and the outcome is clear. Texas is 2014’s prime example. The state’s attorney general, Greg Abbott (R), is virtually a shoo-in to take the post that Gov. Rick Perry (R) has held since late 2000. Yet Democrats have a national star as their potential nominee, state Sen. Wendy Davis, whose pro-choice filibuster in the Texas legislature (though unsuccessful) electrified liberals around the country. The once-dominant Lone Star Democrats have fallen on exceptionally hard times, holding not a single statewide office. Davis is part of their push to reignite the grassroots and develop a long-term farm team in a state that could eventually turn Blue (or Bluish) as its Hispanic population grows. Democrats have been bullish on Texas becoming competitive over the next couple of presidential cycles. However, that is a probably a pipe dream: Even if population and political trends continue, the state still may not have legitimate, vigorous two-party competition for another two decades. We have just two rating switches to note in this gubernatorial update: We are moving Maine from Leans Democratic/Independent to Leans Democratic, and Massachusetts from Toss-up to Leans Democratic, for reasons discussed later. Below are our thoughts on some of the 2014 races (along with Virginia’s 2013 contest). This piece does not address every race — only those where we believe there are significant recent developments to discuss. We’ll do a full update again before the end of the year, and we’ll continue to tweak our ratings as developments merit. 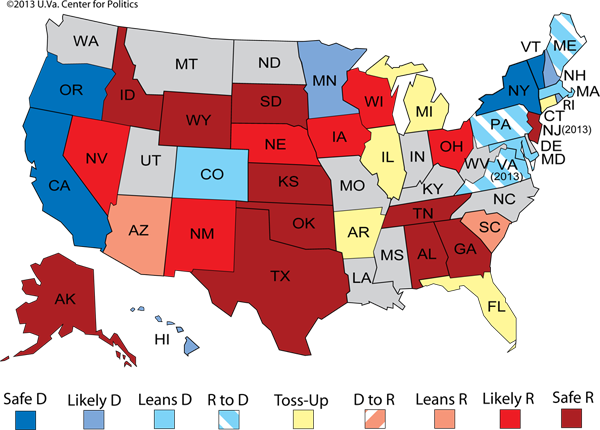 Note: For a full list of our gubernatorial ratings, please click here. Arizona: Last week, state House Minority Leader Chad Campbell (D) announced that he would not seek the Democratic nomination, leaving ex-State Board of Regents President Fred DuVal (D) as the party’s likely nominee. But while the Democratic field may already be settled, many Republicans have declared their intention to run, setting up a potentially crowded battle for the GOP nod. The possible early favorite, Arizona Secretary of State Ken Bennett (R), announced last week that he will indeed run for governor. His main competition may be the other statewide officeholder in the race, state Treasurer Doug Ducey (R). But there are at least three other Republicans vying for the party’s nomination, and given the turbulence seen in some recent GOP primaries, it’s anyone’s guess just how this will play out. While the race is still LEANS REPUBLICAN because of the Grand Canyon State’s natural tilt, it could turn out to be surprisingly competitive, particularly if there’s a nasty GOP primary. Maine: A new poll finds Rep. Mike Michaud (D) at the top of the heap with 40% in a three-way contest, with incumbent Gov. Paul LePage (R) at 34% and Eliot Cutler (I), who just formally announced his bid, at 17%. This survey is just the latest one showing Cutler placing third, a sign that the independent may be diminished from 2010, when he nearly won and finished just two points behind LePage. One factor in this shift is the well-known Michaud, who will get more national support than 2010 Democratic nominee and third-place finisher Libby Mitchell. This development is clearly a boost for Michaud’s chances of taking down LePage, who sources tell us is more disliked for his persona than his policies. With the incumbent’s approval rating only in the high 30s, it’s clear that for LePage to win reelection, he will need Cutler to again win a large share of the vote. Will Sen. Angus King (I), a former Maine governor, endorse Cutler in 2014 as he did in 2010? King may be an independent, but he now caucuses with the Senate Democrats and benefits from the association. That could change his gubernatorial choice — or not; King is mercurial. But if Cutler lags, LePage’s odds of winning fall sharply, and should LePage lose, we believe it will be to Michaud, not Cutler. Because of this, we’re moving this race from Leans Democratic/Independent to just LEANS DEMOCRATIC. Massachusetts: The opposite of Arizona, the Bay State has a very crowded Democratic field and one lone Republican. Having lost to retiring Gov. Deval Patrick (D) in 2010, it appears Charlie Baker (R) is going to get another shot at challenging for the office. Baker is the only declared candidate on the Republican side while others have demurred, most notably former Sen. Scott Brown (R). Who will face Baker is a many-sided question. At the top of the list is probably state Attorney General Martha Coakley (D), who just announced her entry into the race. Coakley is most famous for losing “Ted Kennedy’s seat” to Brown in the famous 2010 special election, a campaign where she was derided for not wanting to shake hands with people outside of Fenway Park in cold weather. This time around, Coakley immediately took care of that, though September is much warmer than January in Beantown. Her main competition for the nomination may be state Treasurer Steve Grossman (D), who has been building support in the strongly Democratic western half of the state. Coakley’s old foe from the 2010 special election Democratic primary, Rep. Michael Capuano (D), is also eyeing the race, having already hired a team of fundraisers and consultants. As the Crystal Ball has pointed out before, Massachusetts has a recent history of electing Republicans to the governorship despite its Democratic DNA. Still, Baker couldn’t win in a heavily Republican year in 2010, and the Democratic nominee could be in solid shape. So we’re calling this LEANS DEMOCRATIC, though it could still go the other way. Michigan: Gov. Rick Snyder’s (R) appearance at the Mackinac Republican Leadership Conference this weekend — a Wolverine State GOP confab held every two years — spawned more than a little presidential buzz around the first-term governor. But before a possible long-shot presidential bid, Snyder first has to win a second term as governor. Snyder got a good poll recently from EPIC-MRA, a prominent state firm, showing him up eight points on his likely Democratic challenger, ex-Rep. Mark Schauer. That is a fairly dramatic reversal from a May survey that showed Schauer and Snyder effectively tied. Memories of Snyder signing right-to-work legislation in a lame duck session in late 2012 may be fading, and the governor probably earned some good will with moderates (and the state’s hospitals and business community) by leading the charge for Medicaid expansion. Voters also seem to appreciate how Snyder has handled Detroit’s financial crisis. We’re still calling this race a TOSS-UP, but at this point the race is closer to moving to Leans Republican than Leans Democratic. One thing to watch: While Snyder is nominated in a primary, his running mate will be chosen at a 2014 GOP convention, and Lt. Gov. Brian Calley is facing a Tea Party challenge from Wes Nakagiri. Calley dominated Nakagiri in a straw poll held at the Mackinac Conference recently, but who knows what could happen at a convention? Democrats would surely enjoy some Tea Party mischief. Virginia: Terry McAuliffe (D) has seemingly had a rough couple of weeks, at least in terms of the newspaper coverage of a notable unforced error by his campaign. Few people had probably ever heard of the Northern Virginia Technology Council (NVTC), but after the group’s PAC decided to endorse state Attorney General Ken Cuccinelli (R) in the gubernatorial contest, McAuliffe’s team and its Democratic allies privately pressured the organization to change its mind. In the process, it came out publicly that during the NVTC’s candidate interviews, McAuliffe had lacked detail and bluffed his way through many responses, while Cuccinelli had been knowledgeable and precise in his answers. Thus, a ho-hum endorsement became front-page news, and McAuliffe’s poor interview became the subject of back-biting leaks as well as a Cuccinelli advertisement. Yet the latest polls must be deeply worrying to Cuccinelli’s campaign. Despite quite a bit of negative commentary for McAuliffe, the latest surveys by The Washington Post, Marist and Rasmussen found him continuing to lead Cuccinelli in the Race for Richmond. Of the available public polls, the last one showing a Cuccinelli lead came out in mid-July — that’s 12 straight showing a McAuliffe lead. In other words, even though McAuliffe had a rough stretch, Cuccinelli was unable to capitalize. Some food for thought: It’s entirely possible that the NVTC affair was just a blip on the public’s radar, with television media focusing more on events such as the recent endorsement of McAuliffe by the Republican mayor of Virginia Beach, the state’s largest city. We have seen nothing to change our pre-Labor Day LEANS DEMOCRATIC rating — including Wednesday night’s debate — but we will obviously keep a close watch on it from our home base here in Charlottesville. Republicans are fearful that Democrats will sweep all three statewide races in November — governor, lieutenant governor and attorney general — for the first time in 24 years, and they’re right to be concerned.